Distribute loads as evenly as possible. Place heavy objects as far forward as possible. Attach the items of luggage to the lashing eyes or using the fixing net » page 70. In the event of an accident, even small and light objects gain so much kinetic energy that they can cause severe injuries. The magnitude of the kinetic energy is dependent on the speed at which the vehicle is travelling and the weight of the object. Example: In the event of a frontal collision at a speed of 50 km/h, an object weighing 4.5 kg produces energy corresponding to 20 times its own weight. This means that it results in a weight of approx. 90 kg “ ”. Store the objects in the boot and attach them to the lashing eyes. Loose objects can be thrown forward during a sudden manoeuvre or in case of an accident and can injure the occupants or other road users. Loose objects could hit a deployed airbag and injure occupants – there is a risk of death. Please note that the handling properties of the vehicle may be affected when transporting heavy objects as the centre of gravity can be shifted – there is a risk of an accident. The speed and style of driving must be adjusted accordingly. If the items of luggage or objects are attached to the lashing eyes with unsuitable or damaged lashing straps, injuries can occur in the event of braking manoeuvres or accidents. To prevent items of luggage from being thrown forward, always use suitable lashing straps which must be firmly attached to the lashing eyes. Items carried in the luggage compartment must be stowed in such a way that no objects are able to slip forward under sudden driving manoeuvres or braking – there is a risk of injury. When transporting fastened objects which are sharp and dangerous in the boot that has been enlarged by folding the rear seats forward, ensure the safety of the passengers transported on the other rear seats » page 9, Correct seated position of the rear seat passengers. If the rear seat next to the folded forward seat is occupied, ensure maximum safety, e.g. by placing the goods to be transported in such a way that the seat is prevented from folding back in case of a rear collision. Never drive with the tailgate fully opened or slightly ajar otherwise exhaust gases may get into the interior of the vehicle – risk of poisoning. Under no circumstances, should the permissible axle loads and permissible gross weight of the vehicle be exceeded – there is the risk of an accident. Never transport people in the boot! Please ensure that the heating elements for the rear window heater are not damaged as a result of abrasive objects. Tyre pressure must be adjusted to the load » page 152, Tyre service life. On class N1 vehicles, which are not fitted with a protective grille, a lashing set which complies with the standard EN 12195 (1 - 4) must be used for fastening the load. The proper functioning of the electrical system is essential for the safe operation of the vehicle. It is important to ensure that it is not damaged during modifications or when loading or unloading the luggage compartment. The following fastening elements are found in the luggage compartment » Fig. 61. Lashing eyes for fastening items of luggage and fixing nets. Fastening elements for fastening fixing nets. The maximum permissible load of the lashing eyes is 3.5 kN (350 kg). The upper front lashing eyes are located underneath the folding rear seat backrest » Fig. 61. 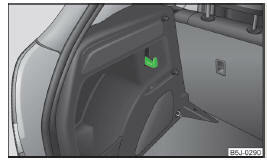 Folding hooks for attaching small items of luggage, such as bags etc., are provided on both sides of the boot » Fig. 62. The maximum permissible load of the hook is 7.5 kg. Fixing examples for a fixing net as a horizontal pocket, floor fixing net » Fig. 63 - A and a horizontal pocket » Fig. 63 - B. Do not exceed the maximum permissible load of the fixing nets. Heavy objects are not secured adequately – there is a risk of injury. The maximum permissible load of the fixing nets is 1.5 kg. Do not place any sharp objects in the nets – risk of damaging the net. The boot cover can be removed if you wish to transport bulky goods. Unhook support straps 1 » Fig. 64. Remove the cover from the holders 2 by lightly knocking on the underside of the cover in the area between the holders. Place the cover on the contact surfaces of the side trim panel. Place the recesses of the cover 3 » Fig. 64 over the holders 2 in the side trim panel. Interlock the cover by lightly knocking on the top side of the cover in the area between the holders. Hook the support straps 1 on the boot lid. No objects should be placed on the boot cover, the vehicle occupants could be endangered if there is sudden braking or the vehicle collides with something. When closing the boot lid, jamming and damage to the luggage compartment cover or the side trim panel can occur if handled in an unprofessional way. The following guidelines must be observed. The recesses in the cover 3 » Fig. 64 must lock in the holders in the side trim panel 2 . The items which are transported must not exceed the height of the luggage compartment cover. The cover must not be jammed in the seal of the boot lid when it is in the opened position. There must be no object in the gap between the opened cover and the rear backrest. Opening the boot lid also lifts up the boot cover. Behind the rear seats » Fig. 65 - B. In this position » Fig. 65 - A the luggage compartment cover is designed for small objects up to a weight of 2.5 kg. Pull the retractable luggage compartment cover in direction of arrow 1 » Fig. 66 as far as the stop into the secured position. Press the cover in the handle area in the direction of the arrow 2 , and the cover automatically rolls up into position. The fully folded luggage compartment cover can be removed to transport bulky goods by pressing on the side of the cross rod in the direction of the arrow 3 and taking it out by moving it in the direction of the arrow 4 . No objects should be placed on the foldable boot cover.